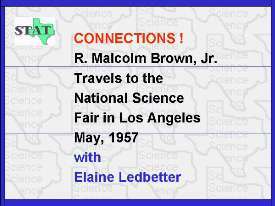 Another connection where Malcolm Brown takes Elaine Ledbetter with him to the National Science Fair in Los Angeles in 1957. Please, STAT teachers, get all of your science fairs on the Internet! I will have more to say about that in a later slide!